A comment in Robert Cringely's history of the first decade of the PC revolution points to this account by an IBM contractor during the development of OS/2. IBM's OS/2 was going to be the next Windows before Bill Gates realized that IBM was, as Clayton Christensen describes it in The Innovator's Dilemma, unwilling to "disrupt" its mainframe business. And so hobbled what was a breakthrough product. Both Cringely and Dominic Connor describe IBM as a behemoth incapable of getting out of its own way. Or as I would sum up the problem: All big bureaucracies behave like big bureaucracies. It doesn't matter how pure their motives, how righteous their leaders, or how hardworking their employers. Managing large organizations is hard, one reason CEOs get paid so much money for doing even a mediocre job. Another classic from the early high-tech era, The Mythical Man-Month by Frederick Brooks, addresses the fallacy that magical economies of scale can somehow solve all of society's problems. Brooks observes that throwing twice as many people at a problem doesn't mean it will get done twice as fast. Often it means that it doesn't get done at all. This is not to say that small is always beautiful. There are very real economies of scale. But it's easier to launch a revolution with a small "band of brothers." 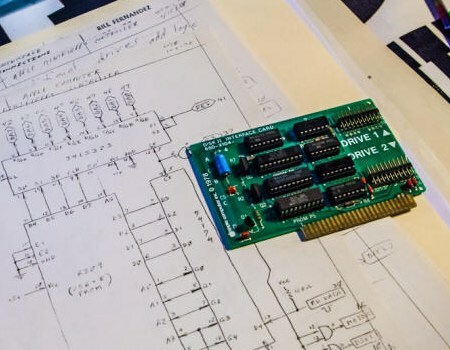 Marvel, for example, at Steve Wozniak's floppy disc controller that made the Apple II the first true personal computer, and the disc operating system he and Steve Jobs commissioned from another teeny-tiny company for a microscopic fee of $13,000. It's easy to forget that behemoths like Apple and Microsoft were once run out of not-metaphorical garages. A handful of people changed the world. Governments as well are corporations, gigantic corporations, and every weakness inherent in the former is doubly so in the latter. Governments can deploy all the police powers available to the state to enforce their own cartels and monopolies, no matter how corrupt or inefficient, against any private-sector competitor. The solution is federalism, which is less a political philosophy than a recognition of how the world--and human nature--works. All it really means is chopping the Leviathan into digestible pieces. The invidious nature of "too big to fail" just doesn't come down to the pernicious political corruption it spawns. Why bother investing in people, plants, and products when "investing" in politicians yields a better return? More importantly, allowing oversized companies to disintegrate through the bankruptcy process whittles them down to a size that normal human beings can again begin to comprehend.